Home › Chemical Guys Buflc_Bp_Da_3 Dual-Action Hook And Loop Molded Urethane Flexibl.. Size: 3-1/2 Inch The Dual-Action Hook and Loop Molded Urethane Flexible Backing Plate minimizesthe heat transfer while it flexes just enough to contour to your vehicle'sbends and curves. These backing plates are built tough and even carry a oneyear warranty. 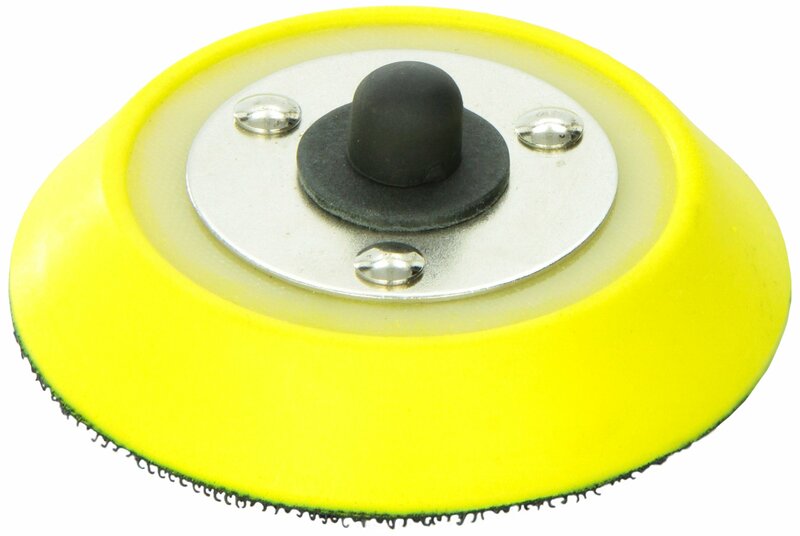 This flexible backing plate is ideal for use with Porter Cable7424 Dual-Action Polisher or the Heavy Hitter Dual-Action Polisher. Urethaneis flexible and very durable. Reinforced inner construction utilizes steelstruts molded into the center hub to give the plate stability whilemaintaining a great even surface for pads. The backing plate is smaller thanthe pads to allow a generous lip of foam to protect the paint surface. Even ifyou turn the pad onto its side accidentally, there is an inch of soft, beveledurethane between the edge of the plate and the inner construction. Thethreaded post fits any polisher with a 5/16 inch diameter.